Rock Island City Hall is located at 1528 3rd Avenue, Rock Island, IL 61201; phone: 309-732-2000. Photo: Connor House, ca. 1876, 702 20th Street, Rock Island, IL. Built for Homer Lowrey. 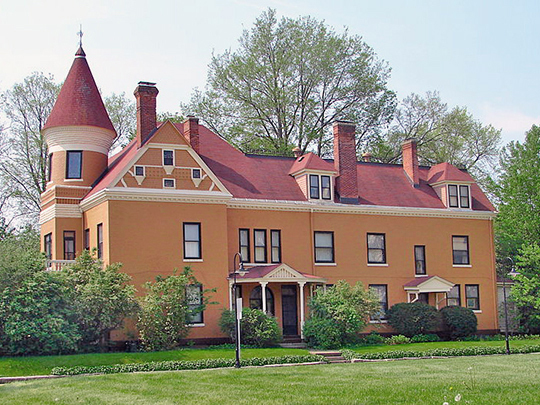 Listed on the National Register of Historic Places in 1988. Photographed by User:Smallbones (own work), 2011, [cc-by-1.0 (creativecommons.org/publicdomain/zero/1.0/deed.en)], via Wikimedia Commons, accessed April, 2013. Located in western Illinois on the Mississippi River, Rock Island is part of a region of communities known as the "Quad Cities," which additionally consist of Moline, Illinois and Davenport and Bettendorf, Iowa, all being located along the Mississippi River. Rock Island's population of over 39,000 therefore contributes to a much larger community impression with the other neighboring, contiguous communities. As with the other communities, Rock Island's existence is due to its location on the river. The city was platted in 1835 on low land between 10th and 17th streets, and was originally known as Stephenson (after briefly being noted as Davenport.) The transportation afforded by the river resulted in the community first existing as a trading post, with the earliest development focusing along the river. Later, the vitality of the community was enhanced by the location of the railroad, including a bridge across the river. The railroad bridge, constructed by the Chicago, Rock Island and Pacific Railroad, was the first such bridge over the Mississippi River. It was completed in 1856. Alice E. Novak, Preservation Planner and Karen L. Kummer, Architectural Historian, Archisearch, Broadway Historic District, Rock Island County, Illinois, nomination document, 1998, National Park Service, National Register of Historic Places, Washington, D.C.